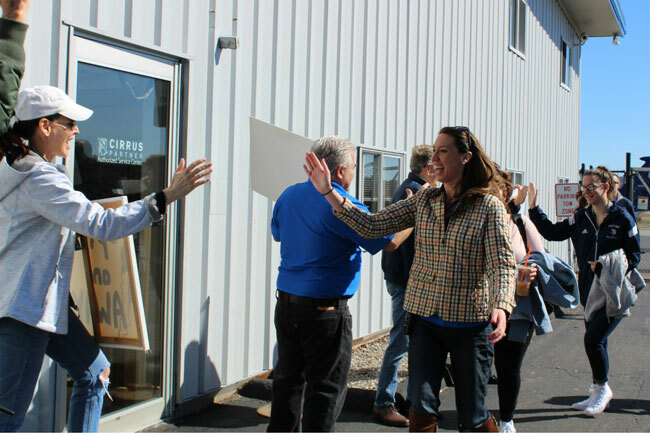 One sunny January morning, arriving for a Ninety-Nines meeting at the Norwood Memorial Airport (KOWD), I was greeted by a sea of cheering, smiling people, ringing cow bells and waving WELCOME signs. Suddenly warmed on a chilly day, I knew I had just come across something special. That, or an exceptionally friendly airport! 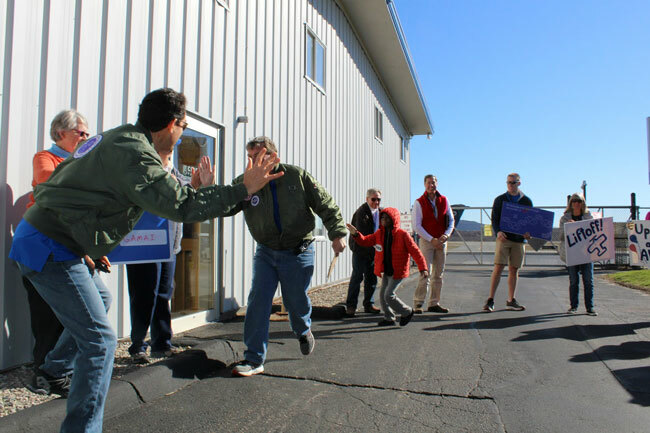 Figuring this was likely not the welcome crew of the FBO, I was eager to find out what all the excitement was about. Inside, I met a tall man in a green, patch-filled flight jacket by the name of Gary Oberstein. As it turned out, Gary was the founder of Above the Clouds, a Massachusetts-based non-profit organization that was hosting the event. A friendly person, with a gentle smile and an obvious passion for what he does, he was more than happy to give the scoop to me and my fellow Ninety-Nines. Above the Clouds aims to do exactly what the name implies—bring children facing serious adversity, such as homelessness, disability and terminal illness—above the darkness in their lives and into the light of hope and happiness. 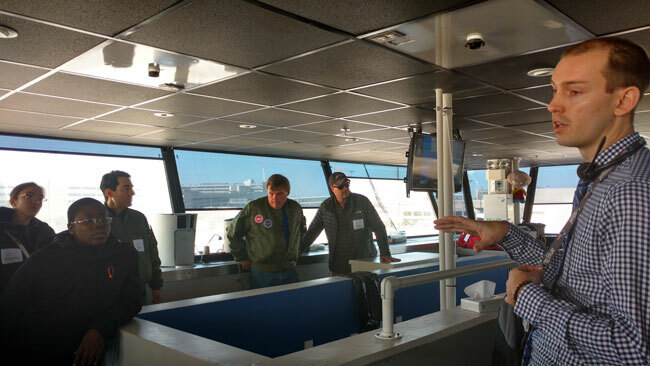 With more than 100 pilot and ground crew volunteers, they accomplish this by sharing with them the wonder of flight. 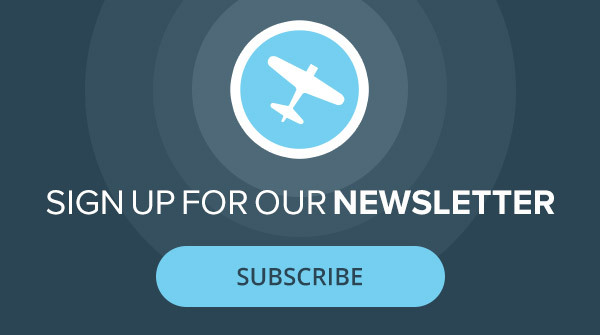 The idea to start this organization came in 2010 when Gary, a Labor & Employment attorney and private pilot, auctioned a flight at a charity ball. The woman with the winning bid surprised everyone by requesting that, rather than taking her up on a flight, the charity choose one of the children they provide services for instead. The surprise didn’t end there, however. The day of the flight, he showed up at the airport to at least a dozen people awaiting his arrival. While most of the crowd was there to support and watch, many more were children hoping for a flight. Seeing the excitement on their faces and not wanting to disappoint, Gary decided to take all of the children up and split them into groups. Shortly after taking off with the first load of kids, however, something scary happened. Loud shrieks sounded from the back of the plane. Alarmed, he looked back expecting to see faces of terror. What he saw instead shocked him—the children were smiling; their eyes, glued to the views outside the window, were aglow with absolute delight. One child especially sticks out in his mind from that day—a 12 year old boy, struggling with a life in poverty. According to Gary, the boy’s older brother was in a gang and he, too, was nearing age for recruitment. The other kids seemed intimidated by him and Gary never saw him smile. Until they were airborne, that is. Witnessing such joy in the kids’ faces and seeing a child inspired to better his life was an experience that changed him. He wanted to do more. December 12, 2012, he officially kicked off Above the Clouds. The organization, funded mostly by individual donors, is made up of three programs—Dream Flyers, Cadet Flyers and Discovery Flyers. 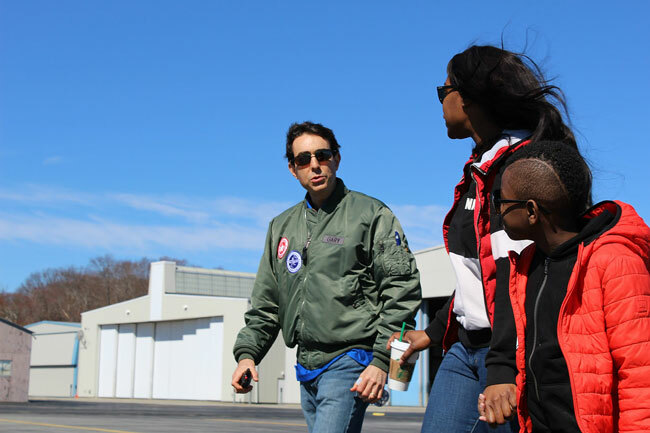 His wife, Martha Oberstein, acts as Chief Flight Coordinator/Director of Operations, finding children for the programs and pairing them up with pilots. 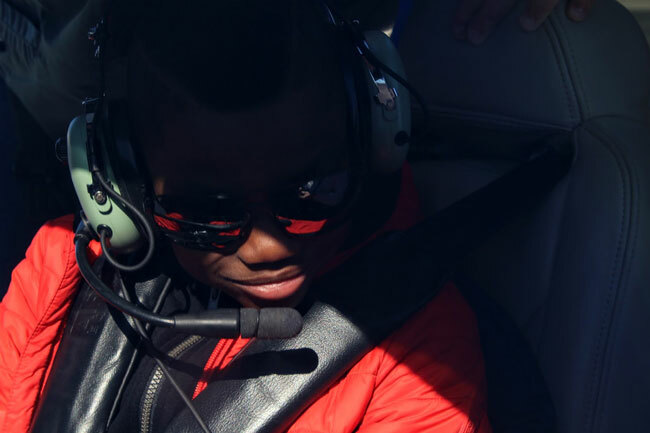 Dream Flyers participate in “Dream Flight” events, where they are individually greeted by a cheerful crowd and given a chance to help create their very own flight plan—generally opting for a flyover of places like their home or hospital. 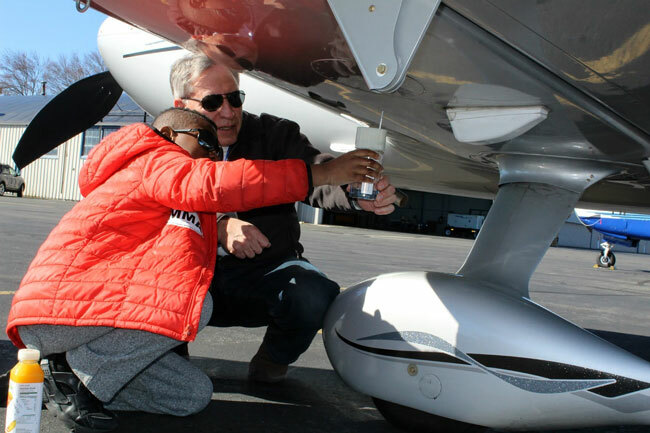 Flights are usually between 30-45 minutes and each child is given a chance to hand-fly the aircraft. 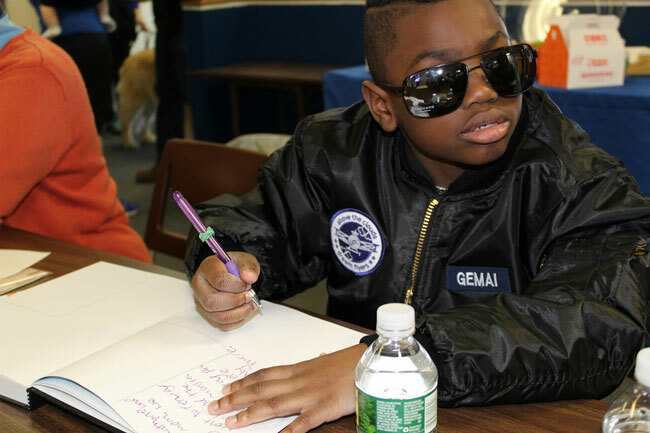 At the conclusion of the flight, they receive their own personalized flight jacket and aviator glasses. For my first event as a volunteer, I was assigned as Ground Crew to photograph a young boy named Gemai. His dream in life was to become a businessman and start his own lemonade stand. It seemed adorable on the surface, but his goal—to be able to afford to buy his mother a new house, “One they can’t take away from us this time,” was quite sobering. Seeing Gemai start the day reserved and end the day with a big smile and a proud strut, and to also witness his doting mother light up at watching her boy in such a happy state, was incredible. The Discovery Flyers program, on the other hand, is aimed at older kids. 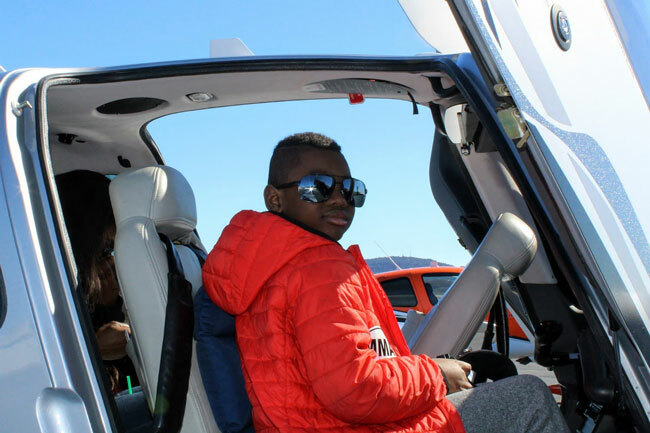 It’s designed to help at-risk teenagers put their energy and focus into something positive, in this case, aviation. Flyers are given mentors and the opportunity to regularly go up with a Discovery Pilot. In addition to being allowed to fly the plane, Flyers are invited on fly-outs to other airports for things like ice cream and a game of catch, as well as given the opportunity to attend aviation-related field trips. 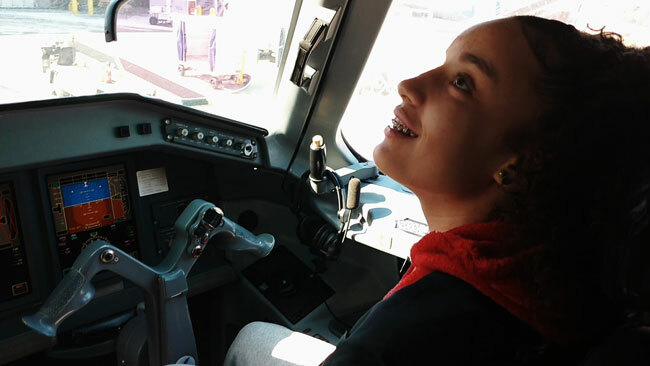 One recent trip was hosted by JetBlue and offered teens a behind-the-scenes glimpse of their operations and aircraft at Boston Logan International (KBOS). 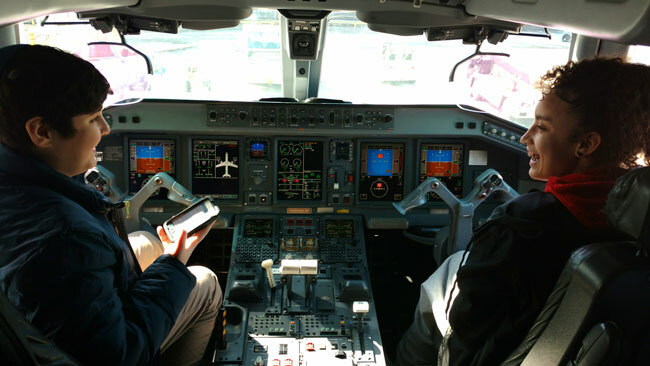 Flyers were given a chance to meet with JetBlue pilots, mechanics and ground crew, and learn about careers and career paths in aviation. The third program, Cadet Flyers, essentially takes Discovery Flyers to the next level. 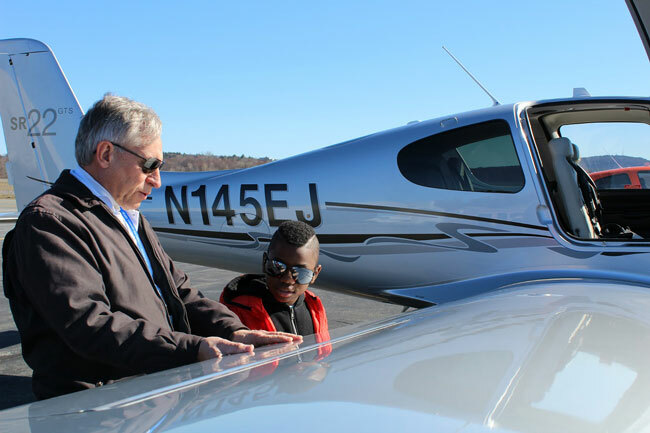 Teens move into this program as spots become available with a Certified Flight Instructor (CFI). As Cadets, not only do they officially learn how to fly, but they can actually be brought all the way up to their first solo. There is a catch, however—in order to stay in the program, teens must also stay in school. Missing even one class for an unexcused reason will get them bumped as a Cadet. The program boosts kids’ self-esteem and allows them to feel in control, something many of them struggle with elsewhere in their lives. To date, three Cadets have achieved solo flight, one of whom went on to earn his private pilot certificate and now, as a freshman in college, is working on his commercial rating. Above the Clouds owns one plane for its volunteer missions, a Piper Warrior II (PA-28-161), but most of the pilots—more than 50 in total—either use their own aircraft or rent. Pilots are required to have 300 hours, be instrument rated and, most importantly, be a safe, effective pilot who is good with children. Despite outside interest to expand the organization to other parts of the country, Gary wants to keep operations local for now. He commented that the tendency is to rush growth, but his goal is to resist that tendency and instead move forward smartly and strategically. “We have a plan,” he said, smiling. The organization recently outgrew its current location and is slated to open a second at Lawrence Municipal Airport (KLWM) October 14, 2017. I will always cherish the moment I first walked into that crowd of warm, friendly people. Becoming a part of Gary and Martha’s organization has been a great honor and has brought incredible joy to my life. I can only imagine how much more it has brought to those in need. To date, more than 300 children have had their lives touched by Above the Clouds. Hopefully many more will be enhanced through the wonder of flight in the years to come. Learn more at Above the Clouds. Desiree Kocis is a Program Coordinator at the Massachusetts Emergency Management Agency. She earned her private pilot certificate in 2016 and is currently Secretary of the Eastern New England Chapter of the 99s.